The World of Althéa: Stolen Goods! As requested by Frank Perez, I am including a few more screenshots of the crafting tomes this week. The first couple of shots show the original tome, complete with contents guide. This shot is different from before, as I have altered the contents guide slightly. The second shot shows where I have used the contents guide to jump to the Armour section, which then shows the first few formulae that a crafter can use at lower levels. After that is another page showing the Boots section. This tome is now complete. This last screenshot shows the beginning pages for the second (and final?) crafting tome that gives details of formulae used with the greater essences: Brilliant and Pristine. Like the previous tome, the beginning gives some basic information and the later pages contain the formulae (which I still have to do for this tome). Note that the contents guide in the screenshot is not finalised as it is using the previous tomes contents guide as a template. For instance, the second guide will not contain the same appendices. Readers of this blog may recall that I am working at trying to allow players to interact with the module in such a way that will induce a reasonable "real life" response where applicable. Complementing this idea, I have made any form of stealing (i.e. 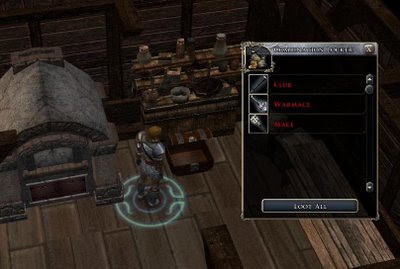 acquiring goods without permission of the owner) more difficult than it may be in previous games and such actions will have an affect on alignment of the party. Should a player play their PC this way, however, then they will most likely get to see the items they steal being written in red text. The text will (in most circumstances) remain red throughout the rest of the game as a clear indication of the fact that it is a stolen item. Such items may or may not be recognised by NPCs in the game, but almost certainly, only black market merchants will consider entertaining such items for purchase. During my coding of the crafting system, I had to consider the affect of Dead Weapons: Weapons that can deteriorate over time if not maintained and Exotic Weapons: Weapons made from a material other than iron. Both have an impact on crafting and I have finished working the code for Dead Weapons, but I have to wait for a new function in patch v1.23 before I can finish the task for the Exotic ones. However, what I can say, even from what I have done to date, is that I am finding the crafting features I have implemented (especially for weapons) do now appear to be having an impact on how the game plays, which I hope players will find an interesting difference when playing this module. 1) Write new code to determine how and when volatile essences will drop to allow players to craft with the greater essences. NB: I have decided that players will have to create all the brilliant and pristine essences from volatile ones. i.e. Creatures will not automatically drop brilliant or pristine essences, thereby making their acquisition much more of an achievement and advancement towards enchanting items than the norm. 2) Add the new SoZ creature parts to the monster drop possibilities. In this campaign, monster parts can be acquired directly from the creature itself rather than being bought at a shop. Whether I choose to have such ingredients accessible at a shop or not yet, I have not fully decided, but even if I do, their quantities will not be limitless. 3) Finish writing the second tome with all the formulae for creating items using the greater essences. This is a more laborious task and requires concentration to ensure the tome layout is comfortable on the eye. I expect at least another week's work here. On the quest writing front, I have been inspired since sorting the crafting system out with a couple of quests that revolve around recipes, molds or general formulae. In this way, I hope the player will be gently, but decidedly involved with the system from an early stage of the game. As I have said before, it would pay the player to become involved if possible, but is not essential if they really want to bypass it altogether. That system you have worked out with stolen weapons looks quite interesting. Are people, like shopkeepers, going to know the weapon is stolen?--or is it only for the PC and his/her companions to know? It's a fairly fresh idea at the moment, but the main thing for now is that the player (or players in a multi-player game) will know what is "hot property" or not, and let them decide whether they want to use it or not. Those are very impressive tomes you made, Lance. Well done.